CLICK THE PICTURE TO VIEW MY STATS! Yesterday was my 1/2 marathon. Right now, I'm really proud of myself. There aren't many things I do for "me" and obviously I ran this for a good cause, but I also wanted to see if I could do this. 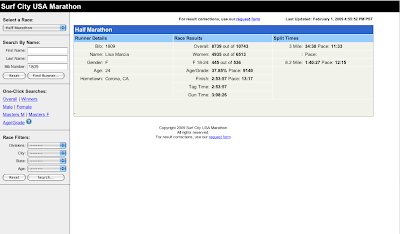 I feel good about my time (it's the TAG TIME) and although my percentages and such weren't at the top of my age group, I knew I had done my best. Many people said, "You'll probably love it so much that you'll do it again." I don't think I would say that about my experience. I think I found it hard to focus because there were so many people around. Mile 3 - I was feeling great. I was running a steady 5.2 mph pace and felt really good. Mile 9.5 - This is when my body started to feel like it was eating itself. My hands swelled up to the point of looking like I had but surgical gloves over my hands and blown them up. It freaked me out because I couldn't really move my hands and it was the first time since starting that I noticed this weird phenomenon. (Come to find out later, this is normal for runners a lot of times) At this moment I really needed prayer, haha. because my face was swollen (water retention) and I just felt gnarly. I got through it through and at that moment the wind picked up behind me and propelled me forward. It sounds like a movie, but it seriously happened. Mile 10.5 - I walked about a quarter mile, if that to down some "shark gummies" for sugars and electrolytes, to stretch, and then I was back at it. I promise to post pics later today! Thank you all for your encouragement, support and prayers. It definitely is something I can look back on and be proud of. Lisa that is so exciting! Good job, girl! congrats on doing it! it's a super big accomplishment and nice to check something off you "bucket list!" you should be really proud! you should definetly put up pictures soon! Congrats again. By the way it was Coach Rutter that I saw. He said he ran the full marathon like 2 years ago.